Along with Rubens and Van Dyck, Jacob Jordaens was one of the great Flemish artists of the 17th century, becoming the leading painter in Antwerp after the death of Rubens in 1640. From that date on Jordaens received important commissions from foreign courts who considered him Rubens’ successor. Jordaens trained with Rubens’ teacher, Adam van Noort, whose studio he entered as an apprentice at the age of fourteen. Throughout his career, which was long and wide-ranging, Jordaens produced mythological, religious, history and genre paintings as well as portraits and tapestry designs. The figures in his works are devoid of idealism and he often depicted popular types of a cheerful, earthy character. In 1615 Jordaens was accepted into the painters’ guild in Antwerp as an independent master and his first known works date to that decade. They comprise two religious compositions of scenes from the childhood of Christ, one of 1616 in The Metropolitan Museum of Art, New York and the other of 1618 in the Nationalmuseum, Stockholm. In the present canvas Jordaens has located a compact group of figures in the foreground. These figures occupy most of the pictorial space, leaving little room for the background. The sacred character of the composition is primarily indicated by the presence of the angel who delicately holds out a bunch of grapes (symbol of the Eucharist) to the infant Christ. The angel places his other arm around Joseph’s shoulder and thus embraces the entire group of the Holy Family as if protecting it. Seated on a rustic wicker chair that appears in other works by the artist, Mary holds a chubby baby Christ who has a small wreath of roses and other flowers on his head while clutching a rosary in both hands. The palette of reds, whites and blues is characteristic of Jordaens who strongly illuminates the composition with a light that falls from the left and models the figures in a volumetric manner reminiscent of Caravaggio. 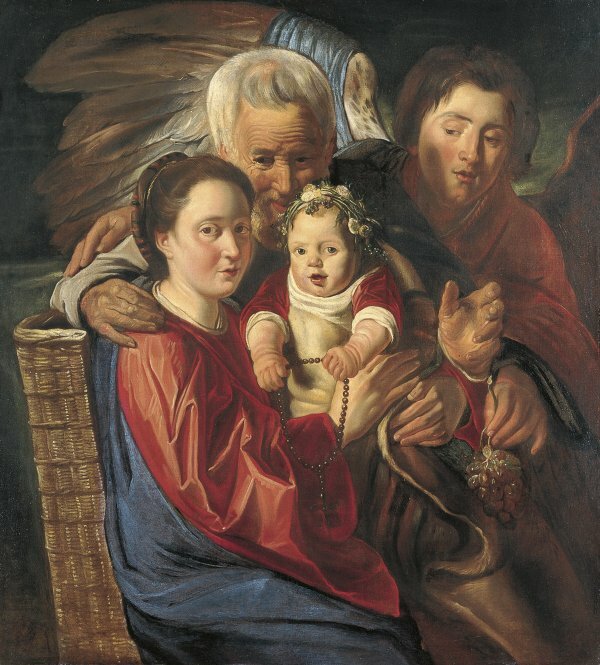 The canvas was considered to be an autograph work by Jordaens until 1958 when it was referred to in an entry in the catalogue of the Museum in Kassel, which has another version of this painting. In that catalogue it was described as a studio or school version of a lost original. 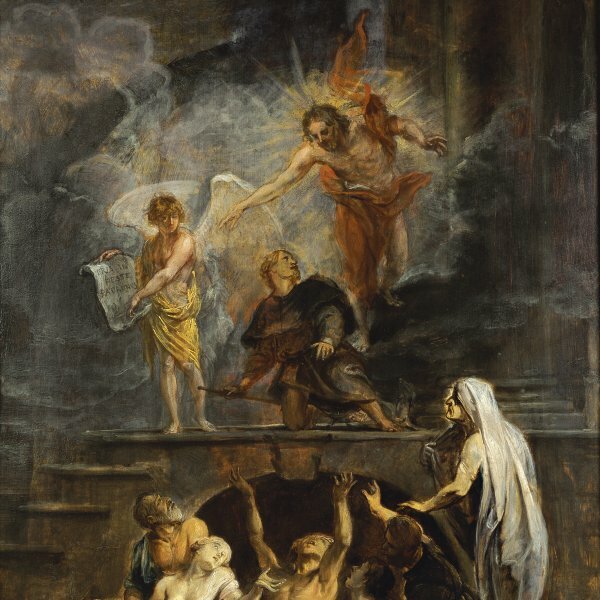 Ten years later in an exhibition on Jordaens held in Ottawa, the present canvas was exhibited alongside two other versions of this composition, one from San Francisco and the other from the August Carl von Joest collection. The latter has exactly the same composition as the present painting and its high quality led experts to consider it an autograph work, while the unequal quality of the handling in the present painting resulted in it being ascribed to Jordaens’s studio. In his text on the painting Gaskell emphasized this irregularity, particularly regarding the heads of the Virgin and Child, which are of better quality than those of the angel and Joseph. Examination using infra-red reflectography in 1987 did not reveal any pentimenti in the design or execution, again suggesting that the present canvas is a replica.